The youth of tennis in Albania in a training with Mr.Luca Santilli, special guest from ITF. 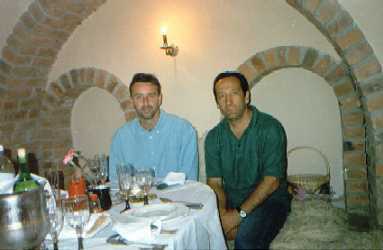 The President of the Federation, Mr.Voshtina (in the right) with Mr.Dave Mailey, one of the leaders of ITF. Albanian students brought back tennis to Albania, after returning from France and Italy in the mid-30's. Some tennis courts were built in Tirana and in other Albanian cities. Young Albanian Tennis players participated inthe few international activities. The best player and supporter of tennis in Albania in this period was Sali Nallbani. After 1955, the communist regime prohibited tennis in Albania, considering it as a "bourgeois"sport and tennis was only played by state employees. This is the reason why some tennis courts were maintained in a good state. The Albanian Tennis Federation was founded in 1985. A national regular calendar was created and it is still active nowadays. After the destruction of the regime in 1991, the bad economical situation made it very difficult to avoid the damaging of the courts, but the Federation has done its best to try te repair them. 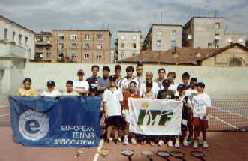 In 1996 the Albanian Tennis Federation became a member of the International Tennis Federation and the European Tennis Federation, which opens a new era to Albanian tennis. In the 90's a special development was seen in Albanian tennis thanks to the exchange of experience with Italian coaches ( especially Mr. Santilli, who came twice in Albania ). Another important activity was the partecipation of many Albanian teams in European and world competitions. In 1999 an important championship was held : The National Championships under 12, for the first time in Albania.